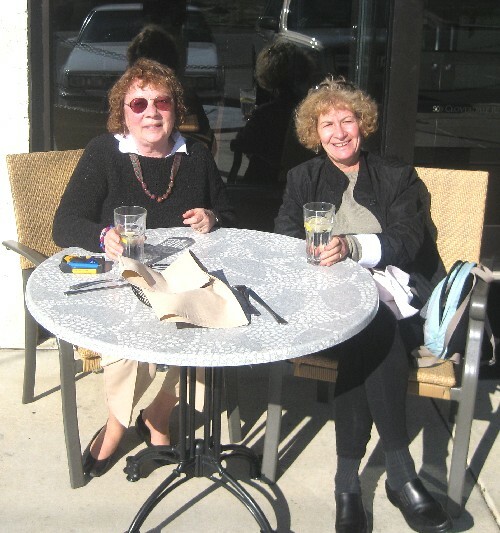 Mary Plummer (left) and Maddy Entel take a break from touring in Montgomery, Ala.
WHO: Madeleine Entel, 58, of Wellfleet, , Mass. and Mary Plummer, 67, of Worcester, Mass. WHEN: A week in January. WHY: “We’d talked about doing a civil rights trip for some time,’’ Plummer said. “We were particularly interested in visiting the Southern Poverty Law Center. We’ve both been members for quite a long time, at least since the ’80s.’’ The coincidental timing of their trip, the week before Martin Luther King Day and President Obama’s inauguration, made the visit even more meaningful, she said. 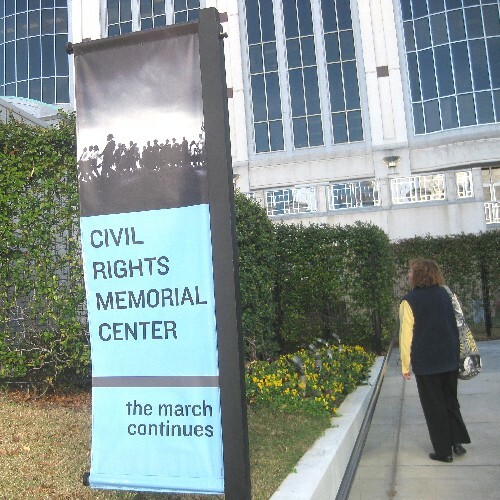 MOVING MEMORIAL: Across the street, they visited the Civil Rights Memorial Center, sponsored by the Law Center and best known for its memorial designed by architect Maya Lin. 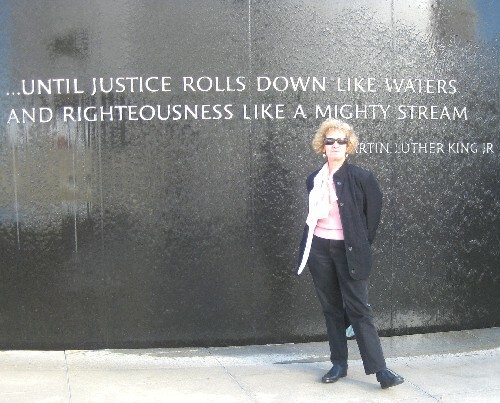 “Water rolls down over a quote of Dr. King, ‘until justice rolls down like waters,’ and over a round slab with names of people honored. You’re encouraged to touch it,’’ Plummer said. 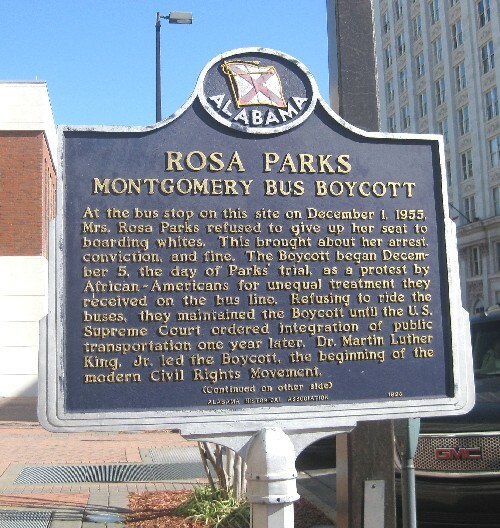 SITES OF RIGHTS AND WRONGS: Other stops in Montgomery included “the First White House of the Confederacy,’’ the former home of Jefferson Davis, head of the Confederacy; the historic Cloverdale neighborhood; Montgomery Museum of Fine Arts; the Troy University Rosa Parks Museum; and Dexter Avenue King Memorial Baptist Church, where King once served as pastor. This entry was posted on October 1, 2009 at 11:58 am and is filed under Civil rights, History, Where they Went. You can follow any responses to this entry through the RSS 2.0 feed. You can leave a response, or trackback from your own site. Read this again after reading it in the Globe. Two wonderful people…or does Diane just ask the right questions, really listen, and find the “wonderful” in the story…in the people? Let’s call it a joint effort. I loved it that they were so excited to meet Joe Levin, cofounder of the Southern Poverty Law Center. Now that’s the kind of celebrity fawning I can admire! Nice post and it is a great place to visit it is very knowlegeable. I was also there with my family and that was a really nice visit.